Cape Region golfers have reason to be proud of the impact of combining their charitable impulses with the game they love. Golf and fundraising for good causes go well together, and the money raised from these events is impressive. According to the National Golf Foundation, golf fundraisers generated an estimated $3.9 billion in 2016, and nearly $20 billion since 2012. Over 80 per cent of all golf facilities host one or more of these tournaments, with 12 million participants. An average of $26,400 is raised from each event. 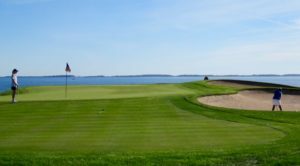 The Cape Region’s clubs and courses are well represented in this sector of U.S. charity, especially during the gorgeous weather it often enjoys in September and October. Here are some examples. The Joshua M. Freeman Foundation held its 11th annual golf tournament Sept. 15 at Bayside Resort, with 120 golfers and several dozen sponsors. The Foundation is perhaps best known for its Freeman Stage near Selbyville, a hugely popular summertime venue for music, theater, and other entertainments. It also runs several arts-related programs throughout the school year. The $115,000 raised by the tournament should help quite a bit. On Oct. 2 The Peninsula in Millsboro hosted the fourth annual Clothing Our Kids tournament. The COK raises money to buy clothes and shoes for elementary school children in need throughout Sussex County. The 2017 edition brought in $60,000 net, from a combination of 132 golfers and 114 business and personal sponsors and supporters. On the same day, the Delaware State Golf Association College Scholarship Fund held its annual fundraiser at Rehoboth Beach Country Club. The Fund provides four-year stipends to three or four college students each year. This event is the primary source for the money. According to Ron Barrows, a longtime member of the Fund’s board, 72 golfers played and over $29,000 went into the bank account. One hundred four golfers played in The Trinity Foundation’s 12th annual Charity Golf Tournament Sept. 29 at the Heritage Shores golf course. The Foundation participates in several charitable endeavors, including support for the Ronald McDonald House of Delaware and the Marine Corps’ Toys for Tots campaign. This year’s event raised $13,400. Some events are on a smaller scale, but the dollars raised are still a big help. The Cape Henlopen Senior Center held its annual golf tournament Sept. 25 at The Rookery South course. The event generated $6,000 net from the many sponsors and the twenty golfers who participated. The members of the Rehoboth Beach Village Improvement Association, established in 1909, perform a wide variety of charitable and civic activities in the area. The VIA golf tournament at Kings Creek Country Club Sept. 11 raised $6,800 from 68 golfers and sponsors. The Cape Gazette is happy to run announcements for these events in this column and elsewhere in its pages, to help generate sponsor and player interest. Women’s golf teams from nine universities enjoyed great weather while competing at Rehoboth Beach Country Club in the 5th annual University of Delaware Fall Invitational Tournament Oct. 21-22. Ashley Dingman won her first individual title in her college career. The UD junior’s two-under par 73-73-68-214 was also the second lowest 54-hole score in the team’s history. The RBCC course used its scenic par-3 19th hole between Rehoboth Bay and the clubhouse as the 10th hole, with the par 72 layout totaling 6,180 yards for the tournament. Penn State University won the team title with an 889 total, with scores from Jackie Rogowicz, Cara Basso, Madelein Herr, and Lauren Waller. Delaware finished ten strokes behind in second place, using scores from Dingman, Thitaree Sakulbunpanich, Valentina Mueller, and Ariane Klotz. The rest of the teams finished as follows: (3) Harvard, 904, (4) James Madison, 905, (5) Towson University, 917, (6) University of Pennsylvania, (922), (7) U.S. Naval Academy, 934, (8) University at Albany, 939, and (9) Bucknell University, 957. For many years, October 31 marked the end of score posting for handicapping in Delaware and other states not blessed with good golf weather year-round. This year the posting season ends Nov. 14 in Delaware, Maryland, New Jersey, the area covered by the Golf Association of Philadelphia, and some other Northeastern states. The new schedule seems to take into account the milder weather in early November that the Mid-Atlantic experienced recently. The new Lewes History Museum is developing a Children’s Discovery Center, and you can help. The Center is hosting an 18-hole scramble format golf tournament Nov. 6 at The Rookery North course in Milford. The $100 entry fee includes breakfast, the round, lunch, gifts, and an award ceremony. The Discovery Center will be a free, year-round activity room for children 3-12. Plans include a scale-model lighthouse, a 19th century cottage, and model shipbuilding. For more information and registration, contact Terri Colegrove at 302-644-0107 or tcolegrove@horizonphilanthropic.com.